| MLS# 219008377 | Southwest Florida Residential Real Estate for Sale. Think about this villa with the lawns maintained instead of a condo, no one attached to you a manageable size and a two car garage. Enjoy the beautiful sunsets over the water as you relax on your extended lanai. 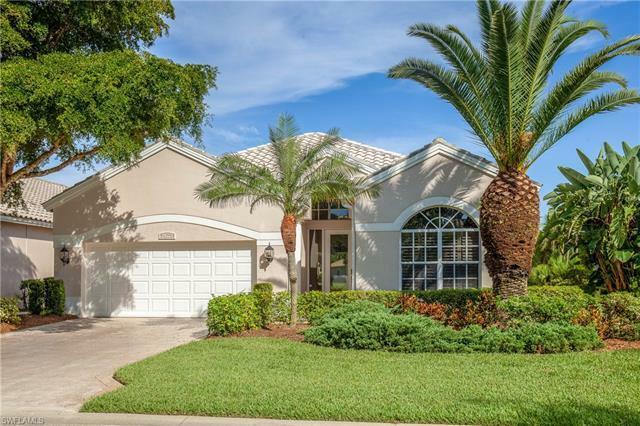 This home is perfect for seasonal and full time residents who appreciate the carefree lifestyle Florida has to offer. Features that enhance this home are the great room concept, 10 FT ceilings, crown molding, heated pool, two car garage, white appliances, electric shutters on the lanai and a neutral palate to make your own. Located in the desirable Capri neighborhood in the amenity rich Pelican landing that offers top class tennis, state of the art fitness, private beach park with boat ride to the Island, bocce, pickle ball, sailing park with a fleet of sailfish, canoe & kayak park and a community boat ram. This is a must see home.